Morgana has no interest in marriage, especially to a man she hardly knows. She is different than most women….she’s as wild as the Welsh moors and would rather spend her days with her horses than in the company of society. But her differences don’t end there, she hasn’t spoken a word since her fathers death when she was a child and to complicate matter further….she’s a witch. So when her mother arranges a marriage to a local drover, Cai Jenkins, Morgana would love to protest but simply can’t. She knows her mother is sick and that she is lucky to find a husband at all, but she can’t help but feel trapped. Cai has recently lost his wife who he loved dearly and has no desire to marry again but in his profession, a wife is a requirement. He happens to see Morgana on a recent drover trip and can’t help but be taken by her beauty and intrigued by her mysteriousness. He approaches her mother and a match is made. On her wedding day, Morgana agrees to the marriage and accepts the new life she will have. When they arrive at his home, Ffynnon Las, she is pleased and hopes that she will find some happiness in this new life. Ffynnon Las is a country estate with a magical history. The tales are considered by most to be old wives tales but Morgana soon begins to wonder if this tales could be true. Perhaps the waters of the estate hold magical properties. While Morgana struggles to discover who she is and how to control her powers, she is also trying to figure out if a relationship is even possible with her new husband. Cai is gentle and hoping he can find happiness with his strange wife. He knows she loves horses and being a breeder, he slowly develops a delicate friendship with her using the horses. But there are evil forces at work in the small Welsh town. There is a dark presence that Morgana feels acutely and is powerless to control. She must learn how to use her magic in order to fight this dark evil and protect the ones she loves. This was an enchanting read. I was bewitched from the start! There were numerous things to love about this book so I will start with the setting. I loved that it was set in a region famous for it’s mythical lore and magical tales. Wales is such mysterious place especially with this moors and mountains…I thought this was a perfect setting for a magical tale such as this. Five stars for the setting! The next thing I loved about this tale was Morgana herself. I was worried about how this story was going to unfold given that Morgana couldn’t speak. I worried that without the ‘dialog’ it would be hard to like her or believe a relationship between her and Cai but I was pleasantly surprised that this wasn’t an issue at all. I was able to easily connect with Morgana and found it equally as frustrating as she did that she could not speak, it was kind of fun to look at things though her perspective. I couldn’t imagine not being able to talk, at times it might be nice as she points out in one chapter having it be nice to not be expected to engage in small talk with those that she doesn’t like….but at the same time not being able to communicate danger would be awful! I loved watching the romance develop between Cai and Morgana. It was fun to see how they learned to communicate even though she was unable to speak. Their romance was beautiful and enchanting…loved it! Since I absolutely love horses and own one myself, I couldn’t help but love the horses in the book. I thought it was so fun to read about them and see what a special bond can be formed between horse and rider. This was an added bonus in the novel for me. The only issue I had was that the villain in this book was a little too obvious. I would have liked for the person to be a bit more of a mystery but it didn’t spoil the book for me at all. It was a fun read and faster than expected. 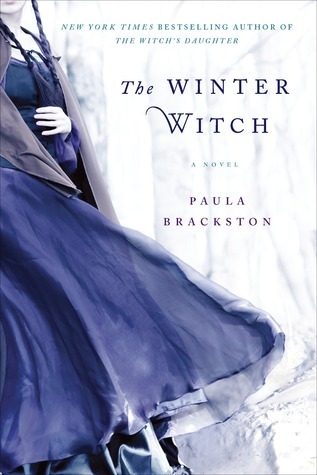 The novel wasn’t just about witches and it didn’t have a ton of over the top para-romance etc, this book was a historical fiction read with a little magic sprinkled in….nothing overly ostentatious or outrageous which was nice. A wonderfully whimsical read with bewitching magical elements. It was a relaxing and engaging read, if you haven’t gotten into the witch genre at all in literature, I recommend this book as a fun introductory read!